Apple's new Universal Links supersede custom URL schemes as the preferred method for linking into apps. 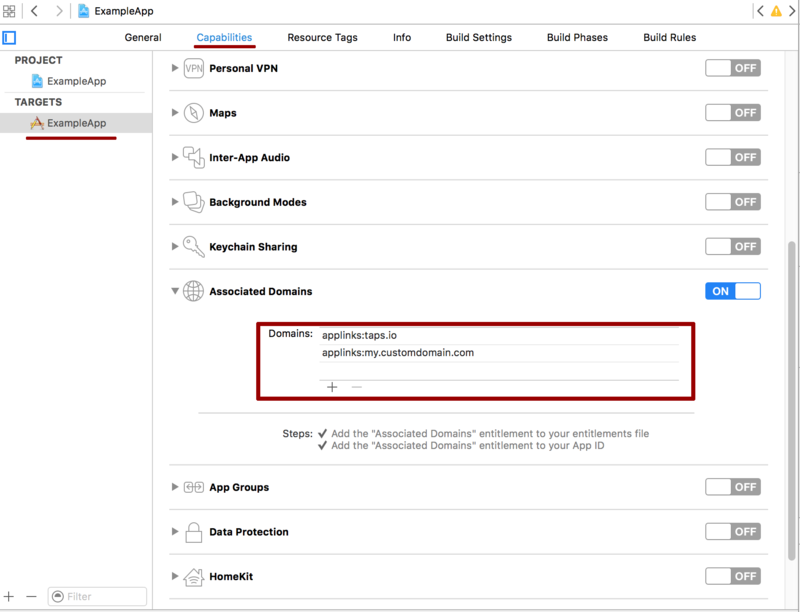 In order to associate itself with your app, Tapstream will need your Apple team identifier and your bundle id. You can retrieve these the Bundle Listing in Apple's Developer portal. You'll also want to ensure that your app has the associated domains entitlement. Once you've got your Team and Bundle ID, go into your Tapstream dashboard. Under the Account Configuration page, find the Apple Bundle Identifiers section and click "Add Bundle." Enter your Bundle and Team IDs here and click the Save Changes button. You can safely skip this section if you don't use custom domains or don't need them to work with Universal Links. Tapstream allows you to choose between two different apple-app-site-association styles for each of your custom domains. Selecting either option is done via the Custom domains section of the Account Configuration page. Namespaced is the default setting for new custom domains. It gives you the most flexibility at the expense of having a url prefix attached to your universal link enabled campaign click urls. This setting adds a /ul/* wildcard entry to your apple-app-site-association file and also an explicit path mapping for all of your UL enabled camapigns. UL and non-ul enabled campaigns can co-exist on the same domain. Legacy campaigns will continue to work without changing any already deployed click urls. New UL enabled campaigns will work post app install. Any campaigns you create on this domain after your initial UL rollout must include the /ul/ prefix on the click url if you want the campaign to work with existing installs. Root wildcard adds a single root wildcard path to your apple-app-site-association file. Legacy campaigns will work without modification. Campaigns created post UL rollout do not require a click url prefix to work with existing installs. All campaigns on this domain will always pop open the app regardless of the campaign being UL enabled or not. To allow Universal Links to work on your custom domain you'll need to either provide Tapstream with an SSL certificate chain and private key which Tapstream will use to serve the apple-app-site-association file or instruct Tapstream to provision a certificate and key on your behalf. Go to the Account Configuration page. Scroll down to the Custom domains section and select the "Automatic" option under "SSL Certificate Handling". Scroll down to the bottom of the page and click "Save Changes". Within a few minutes Tapstream will have provisioned a certifcate for your domain. DO NOT give us your wildcard certificate and key. You should generate a new private key for this purpose. Key size must be at least 2048 bits. Leaf certificate signing algorithm must be SHA-256 or greater. Certificate chain must in a concatenated set of PEM encoded RSA certificates. Private key must be a PEM encoded RSA key. Once you have your key and full certificate chain, go to the Account Configuration page. Scroll down to the Custom domains section, select the "Manual" option under "SSL Certificate Handling" if it's not already selected and click on "Add Certificate". Paste in your certificate and key in the appropriate fields and click on "Upload Certificate." Scroll down to the bottom of the page and click "Save Changes". Campaign links on your custom domain should become accessible via https after a short delay. In your project, head to the Target settings. Under "Capabilities", find the "Associated Domains" entitlement and enable it. Add an entry: applinks:taps.io. If you have a custom domain, add a second entry with the domain, prepended by "applinks:". Universal Links are handled by adding an application:continueUserActivity:restorationHandler method to your AppDelegate. In this method, you'll need to pass the userActivity on to Tapstream's handleUniversalLink method. This is required for Tapstream to record the user visiting the link, since universal links override our usual redirectors. handleUniversalLink accepts a callback, which will be passed a TSUniversalLinkApiResponse object (available from TSUniversalLinkApiResponse.h), which exposes 4 properties: deeplinkURL, fallbackURL, status, and error. kTSULValid means that the link was recognized by Tapstream. At least one of the fallbackUrl or deeplinkUrl properties will be present. kTSULDisabled means that the link is valid, but the campaign has disabled Universal Link support. kTSULUnknown means that Tapstream did not recognize the link. For most integrations, it is appropriate to simply check that the status is kTSULValid. If it is, you may parse the deeplinkURL and/or fallbackURL and display the relevant content accordingly. The deeplinkURL will contain a registered URL as defined by your campaign, while the fallbackURL will contain the fallback URL (i.e., the URL registered with a device type of "ANY"). In the case of kTSULUnknown, you may want to check the error field. If the value is nil, it means the universal link is simply unknown to Tapstream and you should proceed accordingly. In many applications, it will suffice to treat an error condition the same as any unknown link. // Fall back to the original URL if link was not handled. Universal Links can be enabled on a campaign-by-campaign basis. Just edit a campaign and make sure the "Universal Links" toggle is on.